Shoulder Injury Physical Therapy | Podiatry Associates, P.C. When you hurt your shoulder, it makes a definite impact on your life. After all, shoulder injuries can prevent you from lifting, carrying, and reaching. It might hurt when you try lying down to sleep, or even when you wash your hair. Let’s face it, shoulders are involved in a great deal of the movements that our bodies make. At Castle Pines Physical Therapy, Dr. Jennifer Molner can help you recover and also regain your strength, to get you moving again without pain. Your shoulder is a ball-and-socket joint. The ball of your upper arm bone fits into the socket of your shoulder blade. The rotator cuff keeps it in place. This is basically a formation of tendons that help you rotate and lift your arm. A lubricating sack called a bursa allows these tendons to move freely. A torn rotator cuff tendon (tendinitis) means it’s no longer fully attaching your arm bone and shoulder blade. When this happens, the bursa may become painfully inflamed as well (called bursitis) and only adds to the problem. Your bicep, the muscle in front of your upper arm, helps to keep your shoulder stable. The biceps tendons attach the muscle to your shoulder bones. If these tendons are damaged or inflamed, they can no longer keep the muscle tight, resulting in a loss of strength in your arm, pain, and tenderness. The top of your shoulder bone, or shoulder cap, is called the acromion. If you raise your arm until you get to shoulder height, it narrows the space between the acromion and the rotator cuff. This can cause the acromion to impinge on—or rub against—the bursa and tendon, resulting in irritation and pain. If this happens, modify your activities immediately. Labral tears – The socket in your shoulder blade that your arm bone fits in is called the glenoid. Inside it is a soft lining of tissue called the labrum that helps to stabilize the joint, and also serves as the site where several ligaments attach. Repetitive shoulder motion, like lifting weights, and acute trauma, like a sudden fall, can damage the tissue lining and cause pain, decreased range of motion, and a sense of instability. 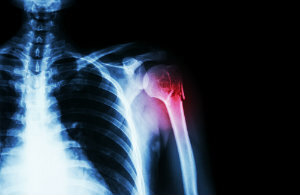 Shoulder instability – Because your shoulder is the most movable joint in your body, it can sometimes become dislocated. The upper arm bone can be forced out of its socket by overuse or a sudden injury. Unfortunately, once this happens, it is vulnerable to happen repeatedly. Chronic shoulder instability is the result. Frozen shoulder – Also known as adhesive capsulitis, frozen shoulder causes pain and stiffness and makes the shoulder become more and more difficult to move. This occurs when the strong connective tissue, or capsule, that surrounds the joint becomes thick and tight. Rigid bands called adhesions develop, and the fluid that lubricates the shoulder capsule is reduced. All together this “freezes” the mobility of your arm. Total shoulder replacement – Mainly a procedure used in severe cases of shoulder arthritis, a conventional shoulder replacement involves replacing the shoulder socket with a plastic cup-shaped device and the top of the upper arm bone with a metal ball that fits into the cup. With rest and rehabilitation, each of these shoulder conditions can heal. Ice can help with swelling and pain, as can medication, but rest is absolutely essential. You should limit the movement of your arm, using a sling if you have to, and eventually you will be able to start physical therapy. The doctors at Castle Pines will guide you through exercises that will restore movement, flexibility, and strength, which in turn will relieve your pain and aide in the prevention of further injuries. If you want to get back to your normal routine as soon as possible, make an appointment with Dr. Jennifer Molner by calling (303) 805-5156. Stop in Castle Pines Physical Therapy in Castle Pines, CO to find out more.